MANILA — The streets here turned purple, as thousands of women from different sectors and communities came dressed in their color to commemorate the 108th International Women’s Day, on March 8. This year’s big protest centered on President Aquino’s “six years of criminal neglect and rotten governance.” The groups also brought to the fore the women’s agenda in this year’s elections. The women decried worse conditions under Aquino’s “daang matuwid” (righteous path) where regular jobs are scarce, women are forced to leave the country seeking better paying jobs abroad only to end up in death row, farmers remain landless and social services like health are being privatized to the point that poor families cannot afford to seek medical treatment. “Goodbye and good riddance! On Women’s Day, we issue a warning to those who aspire to lead the next administration: Women will not hesitate to unite and smash a leadership that will make us suffer the same crooked governance as the current administration,” Salvador said. The women’s group lambasted Aquino for scarcity of regular jobs in his six-year administration. A research by the Center for Women’s Resources said that since 2010, the number of those employed in permanent jobs gained merely four percent increase, while the seasonal or temporary workers posted a 16 percent increase, and those employed on a daily or weekly basis increased by 73 percent. Nenita Gonzaga of Kilusang Mayo Uno women’s department said March 8 was a result of the resistance of women against the worse working conditions back in the day. Women workers walked out of their work area and demanded better pay, shorter working hours and voting rights. “They fought for it and won. But what is the condition of women workers today? They still suffer from low wages that cannot support the family and contractualization is massive,” said Gonzaga. Gabriela also highlighted the case of Mary Jane Veloso, who was sentenced to death in Indonesia. Her mother Celia Veloso lamented how the government neglected her daughter’s case. “Because of a difficult life, Mary Jane went abroad to find a better paying job. Her only dream is to uplift our lives and her children. 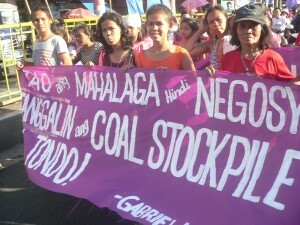 She never thought she would get into trouble,” Veloso said, speaking at the protest. Veloso is still anxious as her daughter’s sentence was only postponed. “It has been one year since her death sentence was postponed. Please help us save Mary Jane. It has been six years that my innocent daughter Mary Jane has been languishing in jail. Wala pa ring linaw ang kanyang kaso,” (There has been no clarity in the case.) she said. Meanwhile, Zen Soriano, Amihan chairperson said Aquino himself is a haciendero who has kept the farmers in the Philippines poor and landless. “Landlord Aquino’s neglect of agriculture is the reason why our economy is stunted and farmers are going bankrupt,” said Soriano. She said under Aquino, lands in the Philippines are being offered to big and foreign capitalists. The “daang matuwid” of Aquino is baluktot (twisted) as he remains callous to the conditions of the majority of the population: the peasants. She said the Filipinos would only be lifted from dire poverty if there is national industrialization and genuine agrarian reform, the two essential requirements to attain economic development. “It has been proven in developed countries that they first implemented agrarian reform before they industrialized. This is where our country should head to – to develop agriculture and have genuine land reform, which will lead to national industrialization,” she said. Misty Lorin, Gabriela deputy secretary general, said they hold Aquino accountable for many issues hounding women, aside from lack of regular jobs that worsens the conditions of women and their families, they also hold Aquino accountable for criminal negligence of victims of typhoon Yolanda. She said they also hold Aquino for the innocent lives that were lost during the Mamasapano encounter and for selling the sovereignty of the country by signing the Enhance Defense Cooperation Agreement. “These are the crimes that we hold Aquino accountable for. We will not let another one of his kind to sit in power,” said Lorin. Eleanor De Guzman, Bagong Alyansang Makabayan (Bayan) deputy secretary general, meanwhile, slammed Aquino for faithfully implementing neoliberal policies dictated by the imperialists. She said, in the time of worsening global economic crisis, the imperialist’s sole intention is further exploitation. “It is not in the imperialists’ interest to develop our country. They are hindering agrarian reform, the establishment of industries that will give jobs and livelihood to the people and develop the economy,” said De Guzman. “As long as the people in power are puppets of imperialists, we cannot expect genuine change,” said De Guzman. She said people must rely on their own strength to attain that change they aspire for. At Mendiola, women leaders “smashed” a 10-foot wall of boxes painted with the images of Aquino with Uncle Sam and Cabinet members, like former Interior Secretary and now Liberal Party presidential candidate Mar Roxas, Department of Social Welfare and Development Sec. Dinky Soliman, Labor Secretary Rosalinda Baldoz and Department of Budget and Management Secretary Butch Abad. “Aquino, aalis ka na lang wala ka pang nagawa para sa mga kababaihan!” (Aquino, you’re about to leave, but you have done nothing for women) said 85-year old Lola Narcisa Claveria who spoke in the program in Mendiola. Women, like Lola Claveria, vow to continue the struggle, no matter how long it takes. Protests were also held in other regions marking International Women’s Day. Gabriela Women’s Party Rep. Luzviminda Ilagan joined protests in Davao City where they highlighted peasant and indigenous women’s vulnerability to abuse and violations amid Aquino’s push for large scale mining concessions and development aggression in ancestral lands. 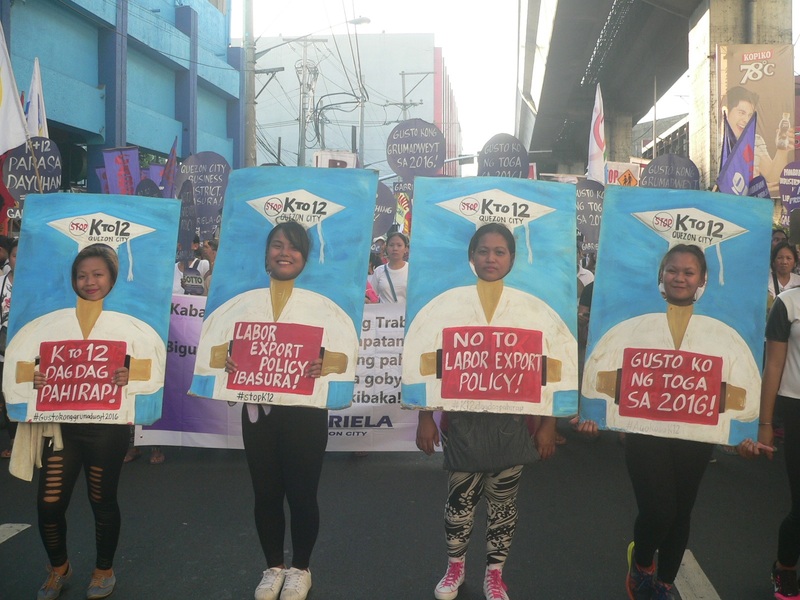 In Baguio City, Laguna, Albay, Bacolod, Iloilo and Cebu, protests highlighted the women’s agenda which called for job creation, industrialization and land reform and the accessibility of basic social services including healthcare, housing and education. “The women’s agenda is a practical reversal of Aquino’s ‘daang matuwid,’ which hailed the policies of liberalization, deregulation and privatization. We say, no more of daang matuwid,” said Gabriela Women’s Party Rep. Emmi De Jesus.